Learn more about how helicopters benefit can the utility industry in Colorado. The stress on existing power grids, the aging infrastructure across the Centennial State and the pressing need for more electrical energy is causing utility companies, local municipalities and contractors to reach out to other avenues when it comes to Colorado transmission line construction. Helicopters are fast-becoming a mainstay in placing power poles and in the critical stringing of transmission lines. Helicopters are quicker and more efficient than traditional methods involving ground transportation and manpower and can reach even the remotest locations. Power companies across the nation are discovering what used to take weeks or months in some cases can now be done in hours and days. It’s a precision operation that is completed by highly trained pilots and linesman. Colorado is the eighth largest state geographically in the United States. It offers a diverse landscape, including mountains, deserts, plains and canyons. Currently, the Centennial State is the 21st most populated state. However, those numbers are on the rise as many folks head west to embrace a healthier, more laid back lifestyle. As commercial and residential development projects move into some of the more remote areas of the vast state, technology typically follows, meaning the demand for power increases as well. Transmission line construction in areas outside of major populated spots like Denver and Colorado Springs can certainly be challenging using conventional methods, which is why helicopter services are increasingly on the rise with utility companies, municipalities and contractors. FairLifts is ready to help commercial contractors, utility companies and local Colorado municipalities in reserving helicopter services for transmission line construction, line stringing, infrastructure inspection, logistical transport and more. Our knowledgeable, professional customer support department has access to a vast network of experience operators and linesman. We can assist you in getting the perfect operator, helicopter and additional hardware to complete your project. Heavy lift helicopters can easily transport air handlers, cement, cooling towers, package units, raw materials and more to construction sites throughout Colorado, reaching even the remotest mountain and desert areas as well as elevated spots. Unlike ground transport, helicopters are faster and don’t need road access. If you have ever threaded a needle, you can understand how difficult stringing wires can be. It is a task that can take a lengthy period of time. However, when you add a helicopter into the midst, the task can be completed in a matter of hours. At times, helicopters may be used so effectively that hundreds of miles of wire can be strung in a days time. With the aging infrastructure, replacing and installing utility poles, is a lengthy and involved process with traditional ground methods. When the damage is a result of a traffic accident, municipalities want a quicker utility pole installation method. Helicopters can remove, install and replace faster than traditional cranes. Before commercial or private development and infrastructure improvement takes place, right-of-way or site inspections are required by most municipalities. Helicopters can complete an array of inspections including pre-construction, traffic control, draining connection, paving, concrete placement and more. They can also assist in inspections to detect infrastructure damage. When development, construction, infrastructure repairs, and inspections reach into remote areas, helicopters are indispensable. 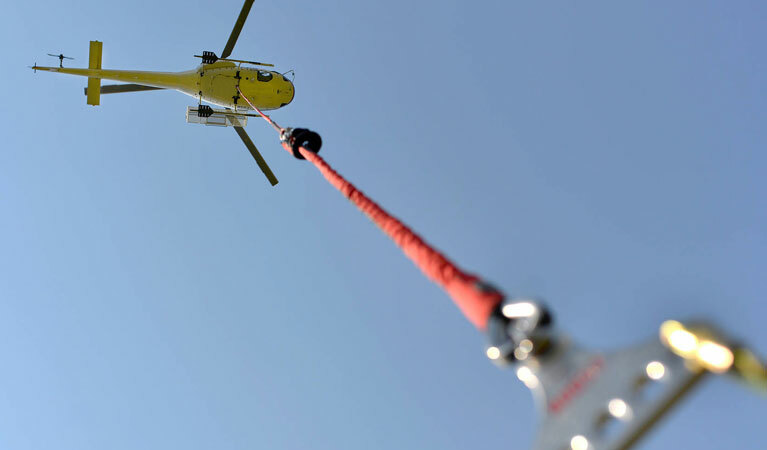 Helicopters are capable of transporting crews and equipment to higher elevations, offshore locations, canyons, difficult to access deserts and hard-to-reach locals. They can also be utilized in lifting necessary supplies and hardware into elusive spots. Experts are standing by to get you a fast quote for your transmission line job in Colorado! To utilize a helicopter lift service for transmission line construction or inspection in Colorado, receive a free quote or consultation, contact FairLifts via our state-of-the-art customer support by telephone or our online contact form. We will respond within 24 hours.